Junk bonds? Their call provisions now promise near zero upside, but they still offer plenty of price & default risk if individual companies and/or the economy go horribly wrong. In fact, most bond/income investments now offer that v same proposition – financial repression‘s virtually eliminated any rate-related upside, while rising rates would cause Christ knows how much carnage… Oh, come back Bernie, all is forgiven. Ouch, feeling some shrinkage there?! OK, steady on – actually, it may not be as horrible as you think..! 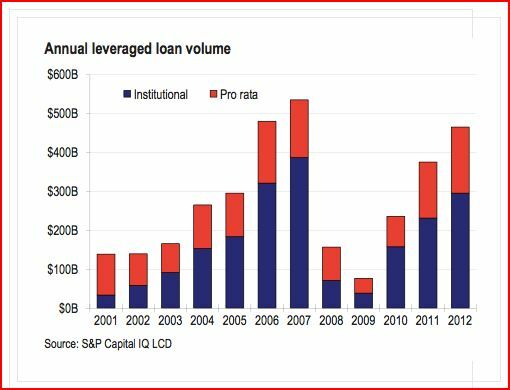 – Leveraged loans are loans made to highly leveraged companies, co’s acquired by private equity firms (LBOs), or (occasionally) middle market co’s. Commercial & investment banks arrange the loans & syndicate them out to a wide variety of financial & investment institutions. – Leveraged loans are obviously non-investment grade, but are secured on the borrower’s assets (thereby ensuring seniority in the capital structure, and higher average recovery rates), covenants are strict, and they’re repayable at any time. As you’d expect, leveraged loan yields trade lower than junk bonds. – They’re generally floating rate (with a minimum floor), and priced at a significant spread to LIBOR (dependent on credit quality). This offers a somewhat unique opportunity in the credit space – they’re pretty price insensitive to rising (and even falling) interest rates. [btw Another common definition of a leveraged loan is any loan priced at LIBOR + 150 bps, or higher]. 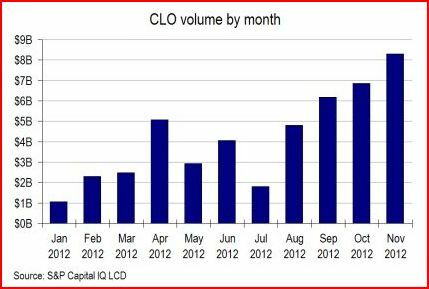 – CLOs are securitization vehicles that invest in leveraged loans. 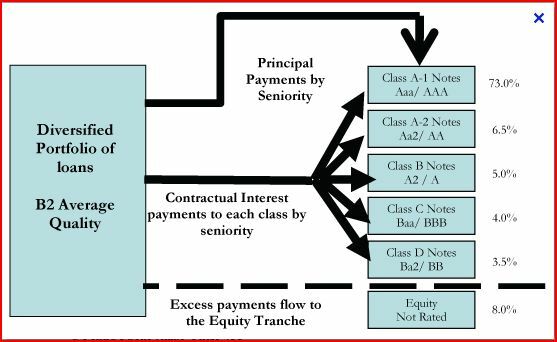 Their liabilities are tranched (ranging from AAA down to BBB notes, a mezzanine tranche, and finally a residual equity tranche), with a waterfall structure for principal & interest payments. This simply means AAA note claims are satisfied first, before any cash flows down to the next-rated tranche, and so on. The residual equity tranche receives all remaining cashflows, once all other claims have been satisfied. – The inverse is also true – that is, all loan default losses are first absorbed by the residual equity tranche, then the mezzanine, the BBB notes, and ultimately by the AAA notes (ideally in v rare circumstances). – Most CLOs offer additional loss protections: i) Credit enhancement – credit insurance/guarantees, ii) Excess spread & reserves – a positive interest spread’s earned, which may be used to build loss reserves, iii) Overcollateralization (O/C) – the CLO sponsor adds additional collateral, say an extra $5 mio for every $100 mio of assets, and iv) Early amortization – an increased level of defaults, and/or certain other events, may trigger an accelerated repayment of principal (AAA notes have priority, of course). – CLO managers have to respect certain parameters throughout the life of the CLO. These include the weighted-average rating factor (WARF), the weighted-average spread (WAS) (ensures assets are selected to earn a sufficient rate spread vs. liabilities), and the weighted-average recovery rating (WARR). Most importantly, specific overcollateralization (O/C) & interest coverage (I/C) tests are set for the CLO portfolio. If tests are breached, amortization (& other remediation actions) are commonly triggered. – The structure, diversification & additional loss mitigation inherent in CLOs should imply a spread discount to the underlying leveraged loans. In fact, they continue to trade at a significant premium – a lingering hangover from the whole 2007-08 CDO debacle. – At their core, CDOs invested in property assets/mortgages, and were built & invested in based on a limited data set, and models & assumptions that never envisaged a nationwide decline in property values. And so, one unprecedented collapse inevitably led to others… Of course, this was all exacerbated by the escalation & wide-scale acceptance of sub-prime underwriting standards & mortgages. – CLOs, on the other hand, were built on the back of nearly a century of corporate credit history. And this worked – yes, CLOs performed well during the financial crisis & emerged with flying colours! Yes, that may be hard to swallow – I definitely recommend you do your own ‘CLOs performed well‘ Google search. Now I look, I think these charts spell opportunity far better than anything else I’ve just written! 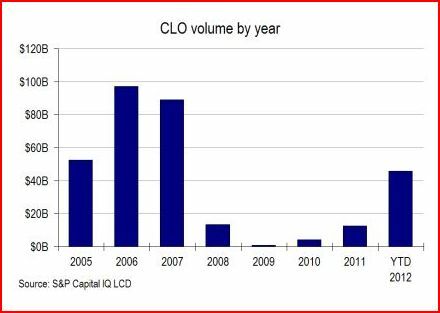 And I’m confident we’ll see further substantial growth in CLO volume & demand this year. It’s v reasonable to expect this will (rather inevitably) lead to a significant catch-up & compression in CLO yields/IRRs. So, we’ve reached the burning question: What’s the best CLO investment? I’ll tackle that in my next post. What did you think to Signet Global Fixed Income (sigg)?It is a fund of hedge funds that specialise in credit. They are in wind up mode with 33p cash due to be returned by September. The price is now 56p but last reported nav is 93.5p. However, assets are us$ denominated so due to recent slump in sterling, the nav should be up to 96.6p now. It’s on my Potential Buy list, but for the moment I’m interested in more active opportunities, rather than event-driven investments. well, don’t leave us hanging here, what is it? I have owned Volta Finance for the last 4 years which has been great, still yield 12% annual dividend and trades at a narrower than in the past yet significant discount to NAV (properly calculated i.e. Mark to Market unlike the other vehicle below). NAV should go back up to 10 Euro in 3 years…hence i am staying long. The other vehicle I have followed in that space is Tetragon….NAV much more debatable as Mark to Model plus very controversial performance fee structure for the asset manager (see press coverage a couple of years ago from angry investors) and price has rallied a lot…. In a similar category (although not Lev Loan collateral but non agency RMBS / Subprime securitization senior tranches), Ellington Financial is a buy even after the recent increase in price. Thks – if I recall, I saw a TLI comment from you elsewhere. LPHI is really the only other stock to consider…and I recommend you don’t – over-priced crap. There may be 2 or 3 other UK/German/Australian listed stocks, but I haven’t kept track of them, as they were micro-micro-caps & not v promising. There is another angle to this investment thesis I’m exploring – I’m not sure yet if anything will come of it. idiotic it was — both bothering to bail out Anglo and AIB… then completely unnecessarily messing around with BoI subs… they tried to confiscate this one and had their arms chopped off in court by our friends — TWICE. i’d say they’re not coming back for a repeat, especially since a) the haircut-power-conferring law has expired b) BOI is able to issue senior and sub unaided c) large coco issue in place in case BOI needs capital again d) has deep pocketed american investors/Noonan drinking buddies at equity level who will have to be meaningfully diluted first. 30p? I won’t quibble. PS Not sure how safe CLOs are going to be when things go south: if the underlying credit goes belly up who is going to look after the interests of the debt held by your CLO instrument? You know, make court appearances, file proposals and injunctions, counter-sue other creditors, etc? The CLO manager? You’re joking, right? Having said that, the great wave of bankruptcies in the sub-IG space is probably some time off — and put off every time investors agree to a covenant losening or buy another covenant-lite issue (as they have been doing last 24 months). Yep, I’ll cover that in the context of my next post. this is how i have traded all my life: every x years we have an income panic and it drives prices of income instruments to insane levels. given that we have been TOLD that rates will stay low through 2015, there is plenty of upside left in all this garbage. the great appreciation opportunity in income bearing instruments lies in US MLPs, imho. MLPs went down a lot because of tax fears; but some — those related to coal — went down even more because “Obama is going to kill coal” and “coal is dirty”, etc. etc. as a result things like NRP (its 10ks are an actuaries wet-dream) – 10 years of rising gross revenues, of rising revenues per ton, rising profits, rising distributable cashflows and — yes — rising distributions could have been bought at a yield of 12% Xmas time. they’ve gone up a lot (about 20%) but still yield in double digits. Put a 7% on that yield and you have another 40% upside. My faves are NRP and RNO.